There are many board games set in space, but most of them focus on things like colonisation, spaceships or weird-looking slime creatures hell bent on interstellar destruction. This rather overused theme could benefit from a refreshing change then, especially if you like your board games a little bit educational — as I do. Step up Big Bang 13.7, by Spanish publisher Invedars and prolific designer Eloi Pujadas. Big Bang is a tile-placement game about expanding our universe from initial spark to the rich and diverse collection of planets we know it to include today. Even more impressively, it’s an awful lot of fun to play. Big Bang takes the relatively complex concept of the dawn of all life and boils it down into a straightforward, addictive tile-placement game. There are two notable ways to play Big Bang, including a simpler variant that excludes certain features and a full ‘Cosmic’ version, which is more demanding and, ultimately, more exciting. To make things easier, I’m only going to describe the full version here, but it’s worth noting that one of the features the simpler variant excludes is the use of a roundel feature that tracks turn order. I will describe this feature here, but if it sounds complex then don’t worry, because the simple variant does away with it in favour of a more traditional scoring track. I’ll also be describing the other rules that relate to the full game, but I will call out any variations for the basic version whenever it is appropriate to do so. At the beginning of each game, each player is dealt one colour card and one card showing a celestial body: either a planet, a meteor shower or a comet. These two cards are usually kept secret and inform the player how they will score at the end of the game. Each player will need to place pieces that match their assigned colour or type of celestial body, with pieces that match both being extremely valuable. Runs of three or more matching pieces (either by colour or type) will score. Even though players use the colour and type of celestial body to drive the placement of their tiles due to scoring, the actual score for each run depends on the backdrop shown on each tile. There are three backdrops available, with stars of different density on each of them, the densest being worth the most points when included in a run. In the harder Cosmic mode, these densely populated systems cost more to place, which is controlled by a Cosmic Clock board. At the beginning of the game, you draw four pieces from a face-down pile and place them below the Cosmic Clock, face up. The first player then chooses and places one tile before moving their counter on the Cosmic Clock forwards by two, three or four million years depending on the density of the stars on the backdrop (in effect, higher-scoring tiles cost more millions of years). The player then takes the rightmost tile from below the clock, flips it back over and begins a face-down discard pile that will later become a new draw pile, once the original stack is depleted. The next player takes their turn the same way. The player who is furthest back on the Cosmic Clock (in effect, having spent fewer years building the galaxy) is always the next player, even if that would cause a player to have two turns in a row. In addition to the celestial bodies, there are also a number of other planets and phenomena that can appear — The Earth appears as a wild card and is placed as normal, whilst the Hyperspace tile lets a player move one of the existing planets elsewhere before being is discarded. Each of these unusual tiles comes with its own cost, with some more expensive than others. Big Bang is a relatively simple game, component-wise, and it comes in a pleasingly small box that makes it a decent portable option. Despite that, it has bright, distinctive artwork that really pops against the black backdrop of deep space to create a clean design. The pieces are largely limited to hexagonal tiles, but they are thickly cut to a decent standard and the printing in my copy was flawless. In additional to the hex tiles, there’s also the double-sided scoring and Cosmic Clock board. This is thickly printed and quite small, but very clear, which again makes it possible to play Big Bang almost anywhere. There are wooden pieces to represent the four players (each a different element). These sit on the Cosmic Clock and again, are clean cut and well printed. The cards that drive the objectives are basic, but entirely fit for purpose. The instruction booklet for Big Bang is a surprisingly thick little tome, which is testament to the relative complexity of the Cosmic mode and the sheer number of other variants described therein. In addition to Cosmic and simple modes, there are also variants like Hexadomino mode (which works just like normal dominoes, really) and a few others, most of which are fun little distractions. 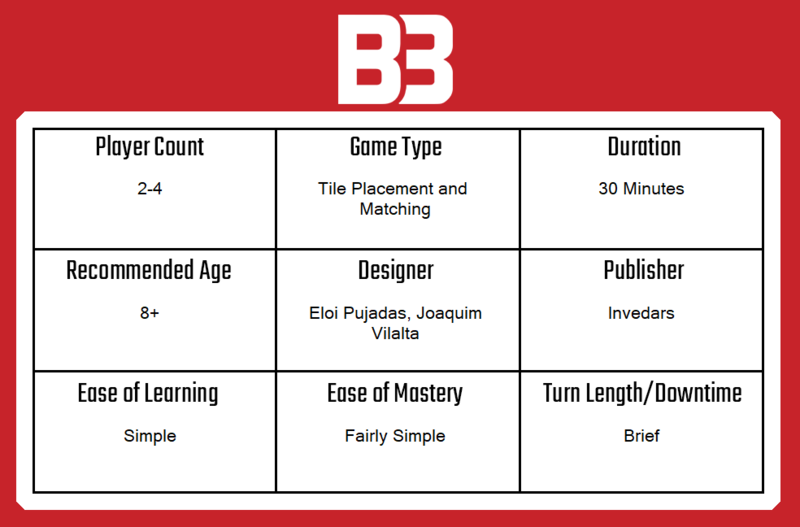 There is some slightly odd language, which I guess is a product of translation, and some features of the game — scoring, for example — are perhaps described in a way that makes them seem more complex than they are. None of this is a major problem, though. I always award games with additional credit when they find ways to increase versatility. Big Bang does this in several ways thanks to the small box and pieces, which make it highly portable, but also because it has so many modes. The simple mode is perfect for younger players or for learning concepts, whilst the Cosmic mode provides a surprisingly deep alternative that will be welcome to experienced players and fans of heavier games. The smaller variant modes all add additional flavour and there’s even a solo mode. Despite this versatility, Big Bang doesn’t lack depth or focus. It takes the single concept of the creation of our universe and introduces playful ways to experiment with it that are both educational and fun. The different kinds of celestial bodies, the density of stars, the use of phenomena like black holes and gravitational pull… it all makes sense scientifically and drives interest, but it also works from a gameplay perspective. The use of the Cosmic Clock is something I particularly like — it introduces some light roundel strategy and prompts players to weigh up the benefits of going for one big move then waiting a long time, or perhaps going for two less powerful ones. The simpler mode was very useful for teaching the game, lasting only around fifteen to twenty minutes, and whilst my children are still slightly too young for it, I fully anticipate using Big Bang to illustrate how our universe came into being. I can’t think of many family games that blend fun, versatility and scientifically interesting content so well, whilst also providing a deep and interesting challenge for adult players. These factors make Big Bang quite an achievement. It will likely come as no surprise to read that I recommend Big Bang heartily. It really does offer an attractive-looking experience — quick and simple to pick up and play, but with real longevity as the result of its different variants and that central Cosmic mode. Big Bang looks interesting on the table and its minimalist art style never fails to draw players in, who can usually pick up the rules just by watching. Whether you are an established gamer looking for a decent pre- or post-session distraction or a family player who wants to benefit from the versatility and educational potential that Big Bang brings, there’s a lot to be excited about in this small box. Harking back to the core experience (which is the Cosmic Mode) and not judging anything else that Big Bang brings, what you have here is a quick-to-learn, fast-to-play, tile-matching game that really delivers on its theme and feels surprisingly deep. A copy of Big Bang 13.7 was provided for review purposes. You can find out more about it on the website of publisher Invedars.